The aim of the current study is to examine metacognitive functioning in people with schizophrenia, in the light of everyday functioning. More specifically, links with several cognitive domains (i.e., attention, executive functioning and processing speed) and social functioning are analyzed using linear regressions. Based on previous literature, a close relationship between social and cognitive functioning is expected, as well as a mediation effect of metacognition on this relationship. The present findings suggest however, that cognition, social functioning, and metacognition are not related. Therefore, the model in which metacognition mediates the relationship between cognitive and social functioning in people with schizophrenia does not hold. Schizophrenia is a very disabling mental disorder, with a usual onset in late adolescence or early adulthood and a lifetime prevalence of 0.5–1% (McGrath, Saha, Chant, & Welham, 2008). Schizophrenia covers a diverse group of individuals, suffering from a wide range of symptoms (Tandon, Nasrallah, & Keshavan, 2009). A Diagnostic and Statistical Manual of Mental Disorders-IV-Text Revision (DSM-IV-TR) diagnosis of schizophrenia is based on the presence of two out of five specific positive symptoms: delusions, hallucinations, disorganized speech, disorganized/catatonic behavior and negative symptoms (e.g., affective flattening, avolition and anhedonia). Social or occupational dysfunction and a measure of duration are taken into account as well (American Psychiatric Association, 2000). Besides these characteristic symptoms, deficits in metacognitive abilities are also common in people with schizophrenia (Lysaker et al., 2005). Metacognition was first described by Flavell (1979) as the ability to reflect upon one’s own thinking and to observe and detect errors in one’s cognitive processes. While metacognition as a singular continuum is intuitively appealing, Semerari et al. (2003) propose that metacognition is modular in nature, with different aspects of metacognition originating from different sources and leading to different outcomes. The comprehensive definition of Lysaker, Dimaggio, Buck, Carcione, and Nicolò (2007; based on Semerari et al., 2003) combines several modular aspects of metacognition: understanding one’s own mind, understanding other people’s minds, decentration, and mastery of the ability to think purposefully regarding a particular problem. Metacognitive capacities “allow persons to form a detailed picture of their own mental states, of the wishes and intentions of the others, and of the inner and social cues that trigger psychological pain”, according to Lysaker, Erickson et al. (2011, p. 413), “and thereby to cope with challenges and solve complex social problems”. The concept is thus strongly related to the ability to cope with the challenges of everyday life, meaning that impaired metacognitive abilities can have far-reaching consequences (Lysaker, Bob et al., 2013). Metacognitive problems in schizophrenia appear to be heterogeneous (Lee, Farrow, Spence, & Woodruff, 2004) and stable over time (Hamm et al., 2012; Lysaker, Olesek et al., 2011; Vohs et al., 2014). Even though metacognitive deficits are also found in other psychiatric disorders, metacognition seems to be poorer in people with schizophrenia. Tas, Brown, Aydemir, Brüne, and Lysaker (2014) have found, for example, that understanding one’s own mind is more impaired in people with schizophrenia than in people with bipolar disorder. Taken together, metacognition can be seen as a symptomatic hallmark of schizophrenia (Vohs et al., 2014). In addition, metacognitive deficits seem to be involved in some of the core symptoms of schizophrenia (Morrison, 2001). Bruno, Sachs, Demily, Franck, and Pacherie (2012) and Carruthers (2012) connect deficits in metacognitive monitoring and/or metacognitive control with judgments being easily accepted, and not being corrected in the face of counterevidence. A disturbed sense of agency over thoughts can also be explained by lowered metacognitive control. The most consistent finding, however, is that low metacognition is related to more negative symptoms (MacBeth et al., 2013; Nicolò et al., 2012). Metacognition is closely related to several outcome measures of schizophrenia. Links have been found between metacognitive deficits, therapeutic alliance and course of illness (Davis, Eicher, & Lysaker, 2011; Koren et al., 2004; Lysaker, Dimaggio et al., 2010). Improvements in metacognition have been associated with less depression, internalized stigma and symptoms (Lysaker et al., 2005) and with better work functioning (Lysaker, Dimaggio et al., 2010), quality of life (Boyer et al., 2012), and social functioning (Penn, Sanna, & Roberts, 2008). Involvement of metacognition in social functioning in schizophrenia has often been found (Lysaker, Gumley et al., 2013). Social functioning deficits in schizophrenia are a common and often very serious problem. Social functioning can be defined as the ability to interact with the social environment, in a way that is generally accepted as normal. Impaired social functioning may include poor social interactions, difficulties in maintaining relationships, and in work-related functioning (Burns & Patrick, 2007). Mental state attribution, or the ability to make assumptions about the mental states of oneself and others, has been found to predict between 20 and 50% of the variance of social functioning in people with schizophrenia (Brüne, Abdel-Hamid, Lehmkämper, & Sonntag, 2007; Brüne, Dimaggio, & Lysaker, 2011). In addition, metacognition has been linked to interpersonal relationships, performance in social role-play, and violence (Bo, Abu-Akel, Kongerslev, Haahr, & Simonsen, 2011; Lysaker, Gumley et al., 2013; Mehl, Rief, Mink, Lüllmann, & Lincoln, 2010). When metacognitive abilities are limited, relationships with others might become so confusing that people socially withdraw (Salvatore, Dimaggio, Popolo, & Lysaker, 2008). Besides the involvement of metacognition in social functioning, being able to reflect upon one’s mental life is also closely connected with cognitive functioning. In a study performed by Lysaker et al. (2005), the four aspects of metacognition were found to relate to several cognitive domains, including verbal memory, visual memory, processing speed, and premorbid intelligence. A possible explanation for this link is that metacognition requires a certain level of cognitive performance. When cognition is disrupted, there may come a point when one can no longer make meaning of daily experiences nor frame a personal sense of self (Tas et al., 2014). However, cognitive performance does not fully predict metacognitive abilities, suggesting that adequate cognitive functioning may be a necessary but not sufficient prerequisite for metacognition (Lysaker & Buck, 2009). Metacognition can influence cognitive functioning as well. Metacognition as defined by Flavell (1979) contributes to the use of cognitive processes in everyday life (Wykes et al., 2012). Support comes from the finding that metacognition is an important factor in cognitive treatment, for example, in people with traumatic brain injury or stroke (Cicerone et al., 2011). One possible mechanism is presented by Cella, Swan, Medin, Reeder, and Wykes (2014), who suggest that metacognitive insight can establish awareness of cognitive problems, and thereby a higher level of functioning. Impaired cognitive functioning has its own impact on functional outcome as well. A significant relationship between cognitive functioning and social functioning, for example, has repeatedly been found. However, even though cognitive functioning predicts between 20% and 60% of the variance of social functioning, cognitive functioning does not fully explain social functioning deficits in schizophrenia (Addington & Addington, 2000; Green, 1996; Green, Kern, Braff, & Mintz, 2000). Studies by Lysaker, Dimaggio et al. (2007; 2010) suggest that social functioning deficits are derived more from difficulties when attempting to make sense of the mental states of both oneself and others, than from basic cognitive deficits (Ottavi et al., 2014). Given the close relationship with both cognition and social functioning, metacognition might act as a mediator in the relationship between cognitive and social functioning. Metacognition is needed to reflect on cognitive processes and contributes to the way cognitive processes are used in everyday life, which directly affects social functioning (Cella et al., 2014; Green et al., 2000; Wykes et al., 2012). Metacognition has already been found to mediate the relationship between cognitive improvement following cognitive remediation and functional outcome (Wykes & Spaulding, 2011; Wykes et al., 2012). In a study by Lysaker, Shea et al. (2010), the effects of cognitive deficits (i.e., executive function, verbal and visual memory, processing speed and verbal intelligence) on the quality and quantity of social relationships were mediated by the mastery aspect of metacognition, even after controlling for symptoms. The other three aspects of metacognition (i.e., understanding of one’s own mind, of the mind of others, and decentration) have not been studied in this way yet. Therefore, it is still unclear whether there is a general mediating effect of metacognition or a specific relationship between mastery and social functioning. To address the highlighted issues, the current study explores the relationship between cognitive functioning, metacognition, and social functioning. This study is among the first to examine whether metacognition (as defined by Lysaker et al., 2007) mediates the relationship between cognitive functioning and social functioning. All four domains of metacognition are taken into account. Metacognition, cognitive functioning, and social functioning seem to be closely related. Furthermore, mastery has already been shown to mediate the cognitive functioning-social functioning relationship. Therefore, it is hypothesized that metacognition has a mediating role on the effect of cognitive functioning on social functioning. Finally, given the close involvement of metacognition in symptomatology found in previous literature, significant correlations between metacognition subscales (understanding of oneself, understanding of others, decentration, and mastery) and symptom severity are expected. Participants were recruited from the Metacognitive Reflection and Insight Therapy (MERIT) study, a randomized controlled trial in which a new metacognitive therapy for patients with schizophrenia is being compared to regular treatment (Van Donkersgoed et al., 2014). The MERIT study has been approved by the medical ethical board of the University Medical Center Groningen. The participants were 52 adults diagnosed with schizophrenia or schizoaffective disorder, according to DSM-IV-TR criteria. All of the participants had impaired metacognitive abilities (as measured with the Metacognition Assessment Scale-A; MAS-A; Semerari et al., 2003), and were in a post-acute illness phase (defined by a mean score lower than 4 on positive symptoms on the Positive and Negative Symptom Scale [PANSS] and no change in medication over the past 30 days). Other exclusion criteria were active substance dependence, co-morbid neurological disorders, and impaired intellectual functioning (i.e., IQ below 70). None of the participants has already benefited from some form of metacognitive therapy. There were 36 men and 16 women participating in the study, with a mean age of 38 years (see Table 1 for demographics). Confirmation of diagnosis. The Mini International Neuropsychiatric Interview-Plus (M.I.N.I.-Plus; Sheehan et al., 1998) is a structured interview, which is developed to diagnose Axis 1 DSM IV-TR psychiatric disorders, and is used in this study for the confirmation of a diagnosis of schizophrenia or schizoaffective disorder, and the exclusion of substance dependency. The interview takes approximately 20–30 minutes, and is divided into 23 diagnostic categories, spread out over different modules. It features questions on symptoms, rule-outs, disorder subtyping, and chronology. The Dutch version of the M.I.N.I.-Plus 5.0.0. was used (translated by Van Vliet, Leroy, & Van Megen, 2000). Assessment of symptomatology. The Positive and Negative Symptom Scale (PANSS; (Kay, Fiszbein, & Opler, 1987) is a 30-item rating scale, completed by clinically trained researchers on the basis of a semi-structured interview. It assesses the presence and the clinical severity of positive, negative and general symptoms that are associated with schizophrenia. The items range from 1 = absent to 7 = extreme, and the interview takes approximately 45 minutes. In order to exclude florid psychotic patients, a mean score of 7 or higher was used as a cut-off in this study. Assessment of social functioning. The Personal and Social Performance Scale (PSP; Morosini, Magliano, Brambilla, Ugolini, & Pioli, 2000) has been developed specifically for the assessment of social functioning in schizophrenia and is based on the social and occupational dysfunction criterion of the DSM-IV-TR. The PSP assesses psychosocial functioning in four domains: socially useful activities, personal and social relationships, self-care, and disturbing and aggressive behavior. All four domains consist of several criteria, of which the degree of dysfunction is determined on a 6-point scale ranging from 0 = absent to 6 = very severe by the assessor. Assessment of cognitive functioning. The Trail Making Test (TMT), part of the Halstead-Reitan Battery (Reitan & Wolfson, 1985), is primarily used to assess divided attention, cognitive flexibility and processing speed. The TMT A and B scores represent the time in seconds needed to succeed in both tasks. Assessment of cognitive functioning. The Digit Symbol Substitution Test (DSST) is part of the Wechsler Adult Intelligence Scale (Wechsler, 2008), and is used to assess visuomotor processing speed. The total score on this test is based on the amount of correctly completed symbols within 120 seconds. Assessment of metacognition. The Indiana Psychiatric Illness Interview (IPII; Lysaker, Clements, Plascak-Hallberg, Knipscheer, & Wright, 2002) is a semi-structured interview, used to get a spontaneous speech sample of the patients in which metacognitive abilities are reflected. Assessment of metacognition. The adapted Metacognition Assessment Scale (MAS-A; Lysaker et al., 2007) is scored on the basis of the transcript of the IPII. Scoring is performed by a consensus group of at least three trained raters. The four domains of metacognition are reflected in the four ordinal complexity scales of the MAS-A: self-reflectivity, understanding the other’s mind, decentration, and mastery. The raters assign one point for each function on each scale that they judge is accomplished in the transcript. Within each scale, metacognitive capacities are arranged in hierarchical order, so that if evidence for a certain capacity is found, the rater then searches for evidence for the next capacity. If there is no evidence for the presence of that capacity, no evidence is sought for higher capacities. Lysaker et al. (2005) assessed interrater reliability by assessing 12 transcripts with two blind raters. Good overall reliability has been found with an intraclass correlation for the total score of 0.89 and individual scales ranging from 0.83 (understanding of others) to 0.89 (understanding of oneself). To determine which patients meet the inclusion criterion of metacognitive deficits, the following cut-off scores are used in this study: 5.5 out of 9 for self-reflectivity, 4.5 out of 8 for understanding of the other’s mind, 2 out of 3 for decentration, and 4.5 out of 9 for mastery). Participants scoring below cut-off on at least three of these scales fulfill the inclusion criterion of metacognitive deficits (Van Donkersgoed et al., 2014). The current study makes use of data assembled in the intake and baseline condition of the MERIT study. The intake session took approximately 1.5 hours and was meant to screen the participants for suitability. During the intake session several interviews were conducted, consisting of the M.I.N.I.-Plus 5.0.0., the PANSS and the IPII. After the intake, a transcript of the IPII was assessed by a consensus group, using the MAS-A. If the patients met all of the requirements, a new appointment was made for the baseline assessment, in which the PSP, TMT, and DSST were administered. This baseline assessment session took approximately 2.5 hours. If participants fulfilled both the intake and the baseline assessment, they received €20. If they only fulfilled the intake and not the assessment due to exclusion, they received €10. The analyses were performed using IBM SPSS Statistics 20. First, descriptive and Pearson’s correlational analyses were carried out. The neurocognitive test scores were standardized into percentile scores, after which a Principal Components Analysis was conducted in order to create a single factor score from the three neurocognitive scores. This was used as an independent variable in the mediation model. When all the assumptions for a linear regression were met, the mediation effect was analyzed with a simple mediation model, in which a direct and total effect of cognitive functioning on social functioning (including metacognition as mediator) was assessed (Preacher & Hayes, 2008). Hayes’s (2014) PROCESS macro for SPSS was used for this analysis. Finally, a Sobel test was conducted in order to test whether metacognition influenced the link between cognitive functioning and social functioning (Preacher & Hayes, 2004). Analyses focused on participants’ raw scores on the PSP and MAS-A overall- and subscales, and on standardized percentile scores on the TMT-A and B and DSST. Data inspection shows that the linear regression assumptions were not violated. Means and standard deviations were calculated for each of these variables (see Table 2 for the descriptive statistics). Descriptive statistics of cognition, metacognition, and social functioning. A bivariate correlational matrix of social functioning, cognitive functioning, and metacognition shows that there is no significant correlation between these three variables (see Table 3). The TMT subtests significantly correlate with each other (r = 0.41, p = 0.003) and with the Digit Symbol Substitution Test (respectively r = 0.38, p = .006 and r = 0.37, p = .006), meaning that a better performance on the TMT is associated with a better performance on the DSST. Most of the MAS-A scales also correlate with each other. The only exceptions are that mastery does not correlate significantly with understanding of others (r = 0.26, p = .063) and with decentration (r = 0.20, p = .156). 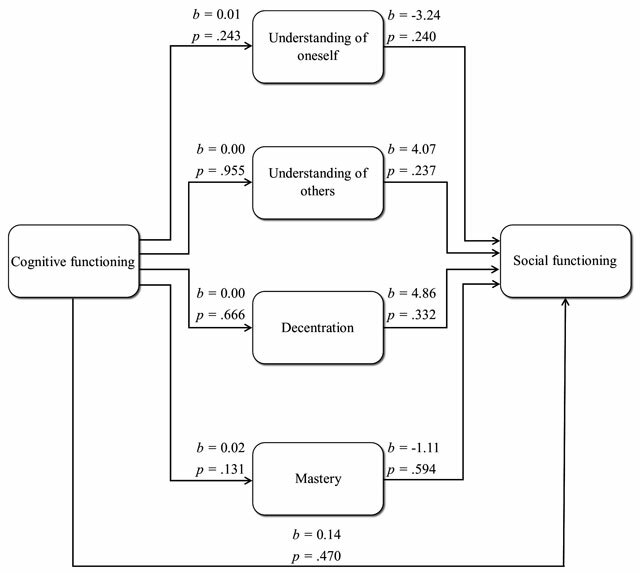 Correlations between social functioning, cognitive functioning and metacognition tests. Note. Metacognition scales: S = understanding of oneself, U = understanding of others, D = decentration, M = mastery. * p < .05 (two-tailed); ** p < .01 (two-tailed). Correlations of symptom severity with metacognition overall- and subscales were computed as well and are presented in Table 4. Negative symptom severity is negatively correlated to metacognition (r = −0.33, p = .017), and in particular to understanding of others (r = −0.38, p = .006). Positive and general symptom severity are not significantly correlated to metacognition, nor to any of the separate subscales. Correlations of symptom severity with metacognition. Next, a principal components analysis of the three cognitive functioning scores was conducted. This produced one factor with an eigenvalue greater than one (eigenvalue = 1.77), which accounted for 59.10 percent of the variance. The factor loadings of each score are shown in Table 5. Principle components analysis loadings for neurocognitive variables. The linear regression of social functioning on cognitive functioning, as conducted with the PROCESS macro in SPSS, shows that there is no significant direct effect of the level of cognitive functioning on the level of social functioning (b = 0.09, p = .446). The regression analysis of the mediator variable metacognition on the independent variable cognitive functioning shows that cognitive functioning does not have a significant effect in predicting a patient’s level of metacognitive functioning (b = 0.04, p = .201). Subsequently, the dependent variable was regressed on both the independent variable and the mediator, as presented in Figure 1. The regression analysis of social functioning on metacognition shows that the level of metacognitive functioning has no significant effect on the prediction of social functioning (b = 0.12, t = 0.12, p = .908). With metacognition added to the model, the direct effect of cognitive functioning on social functioning (b = 0.09, p = .446) is not significantly different from the total effect of cognitive functioning on social functioning (b = 0.78, p = .676; Sobel’s z = 0.09, p = .093, k2 = 0.00). 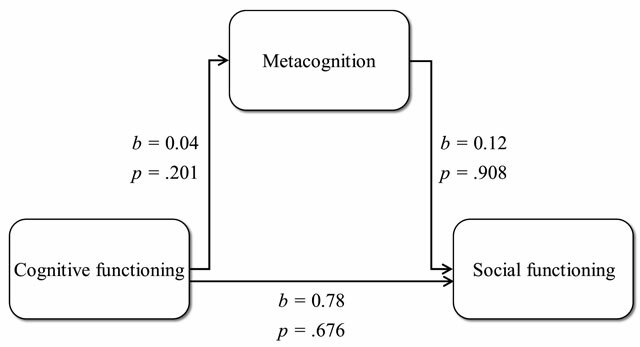 Mediation model, depicting the total effect of cognitive functioning on social functioning, with metacognition added into the model. Path coefficients represent beta weights and p-values. None of the beta weight is significant at an alpha level of .05. Finally, the analysis was repeated with the four different metacognition scales added as parallel multiple mediators. As is clear from Figure 2, none of the metacognition scales has a significant influence on the relationship between cognitive functioning and social functioning. Mediation model, with all four metacognition subscales added as parallel mediators. Path coefficients represent beta weights and p-values. None of the beta weight is significant at an alpha level of .05. In the current study, the mediating role of metacognition in the relationship between cognitive and social functioning has been examined in people with schizophrenia. The results lend no support for metacognition having such a role. First, no significant relationship was found between social functioning and the cognitive domains of attention, executive functioning, and processing speed. Even though cognition has been repeatedly found to be significantly associated with social functioning, results vary widely (Addington & Addington, 1999; Green et al., 2000). Why this variation exists is unclear, but it may relate to heterogeneity in both social functioning and cognitive testing instruments across studies. Besides, it may be possible that the relationship between cognitive and social functioning only exists in the combination of certain social functioning domains and cognitive domains (Addington & Addington, 1999; Green et al., 2000). For example, verbal memory and attentional vigilance have been associated with role-play, whereas executive functioning, verbal memory, and verbal fluency have been associated with community social functioning (Green et al., 2000). Second, no significant relationship between metacognition and social functioning was found. This was the same for self-reflectivity, understanding of others, decentration, and mastery separately, which is in contrast to Lysaker, Shea et al. (2010), who found that the variance in mastery was significantly predicted by cognitive functioning. Lysaker et al. (2005), Lysaker, Bob et al. (2013), and MacBeth et al. (2013) found that poor metacognition leads to social functioning deficits in schizophrenia and that metacognitive training results in better social functioning. The variability in time since onset of the disorder may influence this relationship. Even though Hamm et al. (2012) found that metacognitive deficits are a stable feature of schizophrenia, people who have had longstanding therapy might score higher on the MAS-A scale due to the way they have learned to talk about themselves in therapy. Several methodological issues may play a role as well, which are discussed later as part of the study’s limitations. Furthermore, no significant relationship between cognitive functioning and metacognition was found. Even though poor metacognition is common in psychiatric disorders, it is thought that greater impairments in metacognition are unique to schizophrenia (Vohs et al., 2014). This is possibly partly due to greater cognitive impairment found in people with schizophrenia (Tas et al., 2014). A slight floor effect in the cognitive testing scores may have led to the absence of a relationship between severe cognitive dysfunction and metacognitive impairment in the current data. Again, part of the explanation might lie in the specific cognitive domains involved. Executive functioning and verbal memory are especially needed to form representations of oneself, but in the current study only one aspect of executive functioning was examined together with attention and processing speed (Lysaker, Erickson et al., 2011). For a meaningful understanding of the cognitive underpinnings of metacognitive deficits, more research is needed into these concepts, with a separate consideration for the different cognitive domains. No relationships between cognition, metacognition, and social functioning were found in the study. This was the same for self-reflectivity, understanding of others, decentration, and mastery, which is in contrast to Lysaker, Shea et al. (2010), who found that mastery mediated the relationship between cognitive and social functioning. It is unclear whether this inconsistency is due to the complexity of the relationship between cognitive functioning and metacognition or to methodological issues (such as heterogeneity of cognitive domains). Interestingly, this study found that when negative symptoms are more severe, metacognitive abilities are worse. This is in line with many earlier findings (Nicolò et al., 2012). Only the relationship between negative symptoms and understanding others is significant in this study, which is consistent with former studies in both chronic and first-episode psychosis samples (Lysaker et al., 2007; MacBeth et al., 2013). Understanding of one’s own mind has been found to be associated with metacognition in chronic samples, but not in first-episode samples. If the association between understanding of one’s own mind and negative symptoms becomes stronger over time, the diversity in time since onset of the disorder in the current study may be able to explain the non-significance of this association. The results of the current study combined with these earlier findings suggest that understanding of others might be more specific to the early stages of the disorder (MacBeth et al., 2013). The lack of association between metacognition and positive symptoms is consistent with a meta-analysis of Varese and Bentall (2011), who found that after controlling for emotional distress and other comorbid symptoms, hallucination-proneness is no longer significantly related to metacognition. This suggests that the role of metacognition in schizophrenia may be better understood as a shared vulnerability factor associated with multiple forms of psychopathology, rather than symptom-specific (Goldstone, Farhall, Thomas, & Ong, 2013). Several methodological limitations of the current study warrant mention. The most important of these is that all participants scored low on the MAS-A, since impaired metacognition was one of the inclusion criteria of the MERIT study (Van Donkersgoed et al., 2014). The subject sample thus consists of a selection of schizophrenia patients with a restricted range of metacognitive capacity, resulting in a non-representative sample. It may be that links between metacognition and social and cognitive functioning are more apparent in a more extended range of metacognitive functioning. A second limitation of this study is the selection of cognitive tests. These cognitive testing instruments are somewhat limited, and might not capture important elements of cognition that are linked to social functioning (Meyer & Kurtz, 2009). Several studies have shown that verbal memory and vigilance are related to functioning outcome (Green, 1996), and that executive functioning, and visual and verbal memory are linked to metacognition (Greig, Bryson, & Bell, 2004). Lysaker, Shea et al. (2010) used a more extended test battery, including processing speed, vocabulary, visual memory, verbal memory, and set-shifting. They found that mastery mediated the relationship between social and cognitive functioning. One of the differences with former comparable studies is the choice of the Personal and Social Performance Scale (PSP) as social functioning testing instrument. The Global Assessment of Function scale, the Global Assessment Scale, and the Social Functioning Scale are the most frequently reported social functioning scales in the assessment of schizophrenia but the PSP is not often used (Burns & Patrick, 2007). These frequently-used scales differ from the PSP in that they focus on the degree of social engagement, whereas the PSP measures the social competence domain of social functioning (Cohen, Forbes, Mann, & Blanchard, 2006). The PSP also differs from some of the frequently-used scales in that it is solely based on the appraisal of the assessor and not on self-report. Finally, quality of life scales are also frequently used to assess social functioning, such as the Quality of Life Scale. These also measure a different construct than the construct as measured by the PSP (Burns & Patrick, 2007). Since some of the results of this study contrast with those in previous studies, it would be an interesting study to replicate. Within the current MERIT study, schizophrenia patients with a higher level of metacognitive functioning are being assessed, providing a more representative sample of schizophrenia patients. Running the analyses again using this newly-acquired sample will hopefully indicate whether the expected links between metacognition and other variables are indeed present in schizophrenia patients with higher levels of metacognition. Furthermore, it would be interesting to use a different cognitive testing battery with a variety of cognitive domains (including executive functioning, vigilance, visual and verbal memory), together with different social functioning testing instruments, since simultaneous multidimensional assessments of social and cognitive functioning are scarce. When the impact of metacognition on functional outcome is ascertained, there might be significant implications for treatment of social functioning deficits in schizophrenia (Ottavi et al., 2014). In conclusion, this study found that metacognition does not mediate the relationship between cognitive and social functioning in people with schizophrenia. This is the same for specific aspects of metacognition (i.e., self-reflection, understanding of others, decentration, and mastery. It is unclear how much the methodological issues or other confounding variables influenced these findings. The results of the current study suggest that in order to understand better the impact of metacognition in schizophrenia, we have to improve our understanding of the role of metacognition in the development of the disorder. Hayes, A. F. (2014). PROCESS for SPSS and SAS (Version 2.13) [Software]. Available from: http://www.processmacro.org/download.html. Reitan, R. M. and Wolfson, D. (1985). The Halstead–Reitan Neuropsychological Test Battery: Therapy and clinical interpretation. Tucson, AZ: Neuropsychological Press. Van Vliet, I. M., Leroy, H. and Van Megen, H. J. G. M. (2000). MINI Internationaal Neuropsychiatrisch Interview, (Nederlandse versie 5.0.0). Wechsler, D. (2008). Wechsler Adult Intelligence Scale–Fourth Edition technical and Interpretive manual. San Antonio, TX: Pearson.